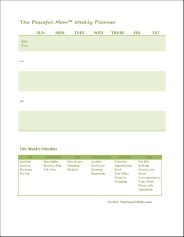 Click to print The Peaceful Mom Weekly Planner 1. Set A Planning Day and Time- I will be reserving Sunday evenings for my planning and reflection time. Set Priorities-Before planning my activities I decide on my priorities for the week. The Peaceful Mom Weekly Planner 1 has a reminder list on the lower half to make sure that no important items get left out. There is also space to fill in additional priorities. I realized after I completed this week’s plan that I left out any time with friends so I will be correcting that. I will also probably spend Sunday afternoon resting and catching up on some reading. The Weekly Planner will be in the front of my Brain in a Binder which I will be posting more about soon. 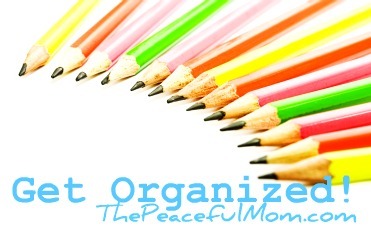 Here’s to getting organized! This is perfect! Is there a way to get a blank copy of this so that I can add my own items in the Me, marriage, kids, etc. sections? Thanks!